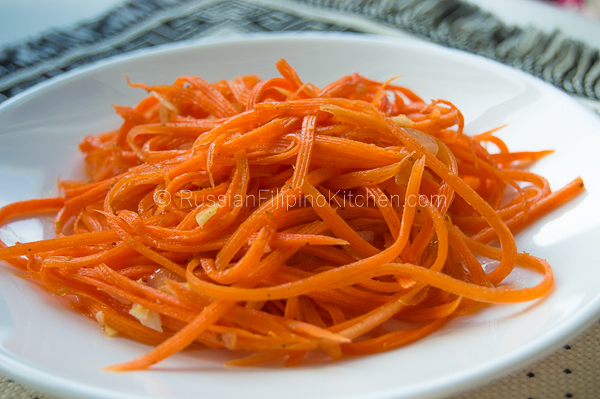 I know the title sounds a little weird but this carrot salad recipe I am going to share with you is a popular salad all over Russia but actually of Korean origin. 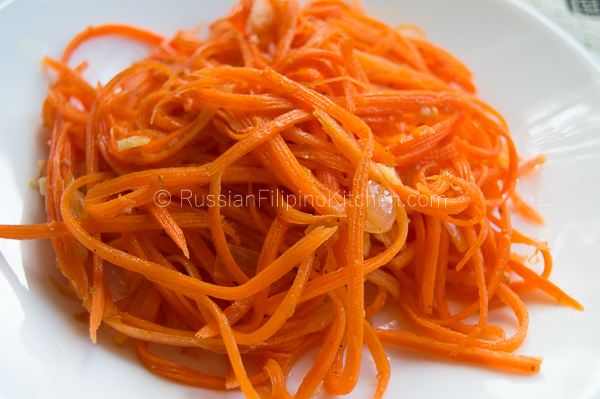 Simply known as “Korean carrot”, the salad was invented by ethnic Korean immigrants in the early 1900’s. During Stalin’s rule, they were relocated to remote areas of the Soviet Union where they learned to adapt and use whatever ingredients were available on hand for food. The carrot salad came about as carrots grew well where cabbage did not. Cabbage, by the way, is the main ingredient in “kimchi” or spicy pickled cabbage– Korea’s national dish. This salad reminds me of a Filipino pickled green papaya salad, known as “atsara”. They’re somewhat similarly prepared and even taste very close. 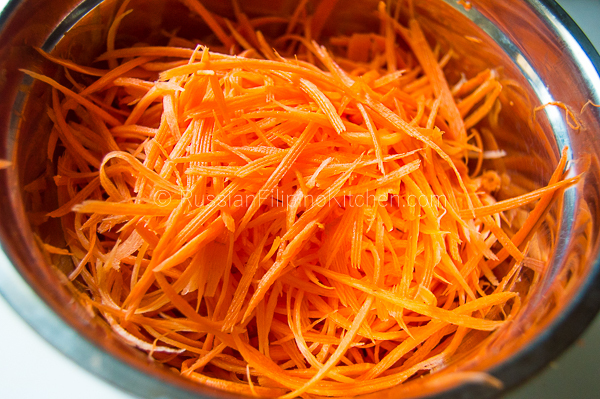 To make the carrot salad, you’ll need a special shredder or peeler that makes thin, long strands–almost like noodles. You can readily buy this at almost any store that sells kitchen gadgets or even online where I got mine. 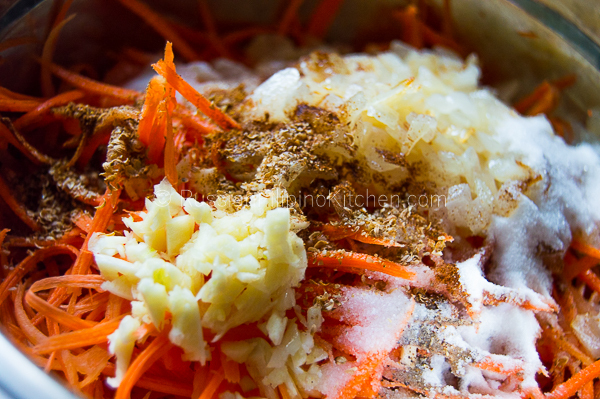 After shredding the carrots, you mix everything together and let it sit for a couple hours to enhance the flavor. I love making this in huge batches when we buy carrots in bulk. It tastes better if you let it sit in the fridge for like three days. It’s perfect as a side dish. I love eating this salad with rice and fish. It’s important to note that you can adjust the seasonings according to your taste. I like mine slightly spicy, a little garlicky but not too overpowering, sour and sweet, and a little salty. This is my go-to salad and one of my favorites in Russian salads. 1. Wash and peel carrots. 2. 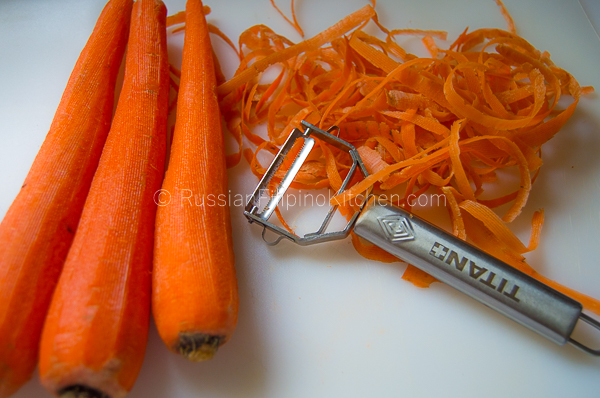 Use julienne peeler or slicer to shred carrots into noodle-like shape and length. 3. Place in a large mixing bowl. Set aside. 4. 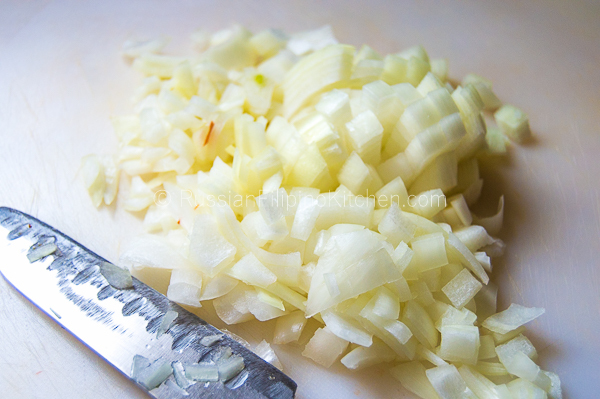 Peel and chop onion. 5. 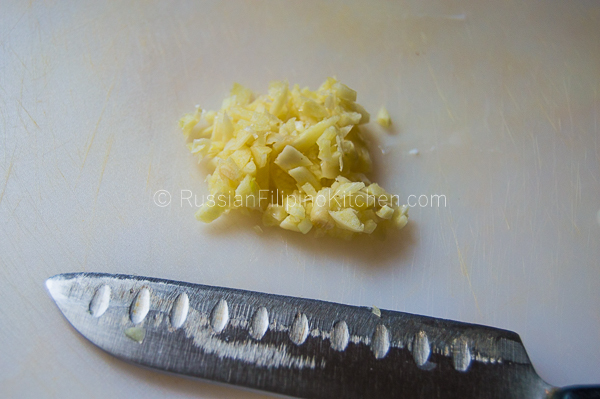 Smash garlic with the side of your knife and mince until very fine. 6. 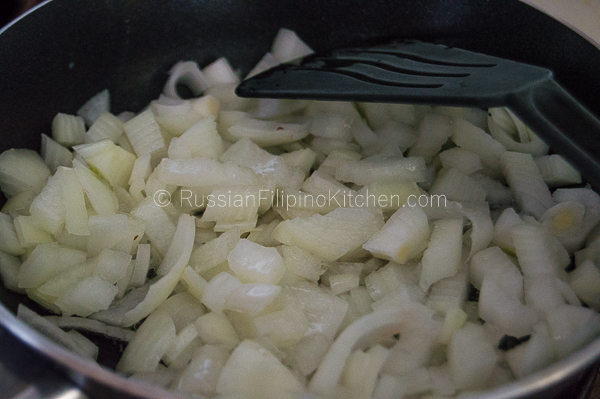 Heat up a sauté pan over medium low heat, add the oil and sauté chopped onion till softened but not browned. Remove from heat. 7. 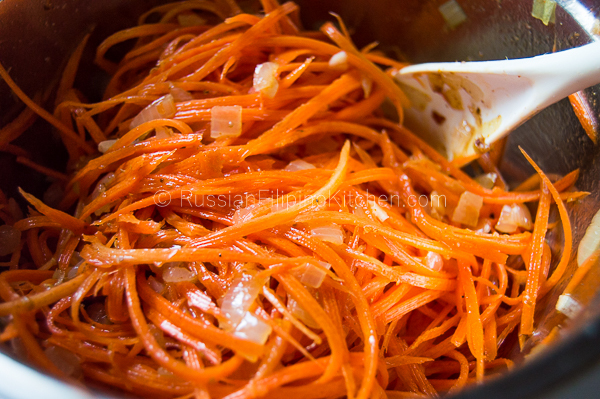 Transfer softened onions into mixing bowl with carrots. Add the rest of the ingredients and mix until well-combined. 8. Transfer to a glass container with lid and refrigerate for at least an hour before serving. 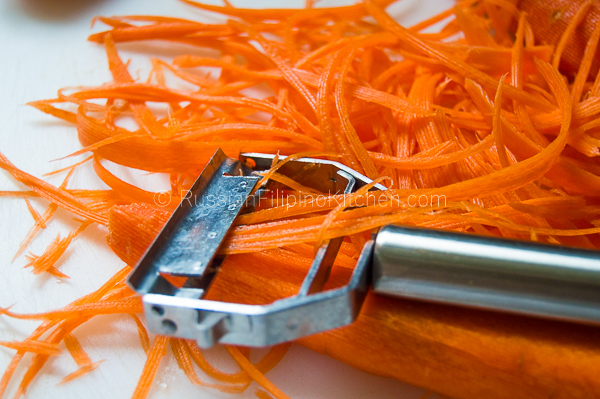 Use julienne peeler or slicer to shred carrots into noodle-like shape and length. Place in a large mixing bowl. Set aside. Smash garlic with the side of your knife and mince until very fine. 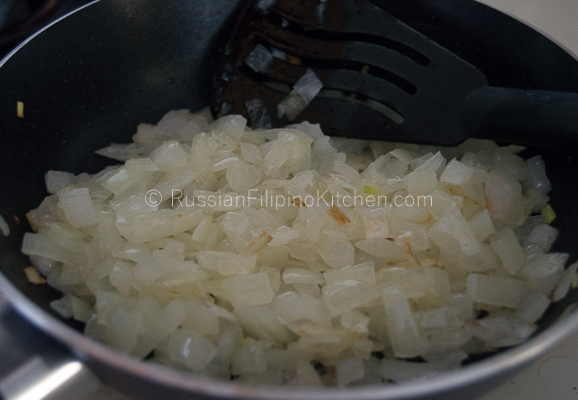 Heat up a sauté pan over medium low heat, add the oil and sauté chopped onion till softened but not browned. Remove from heat. 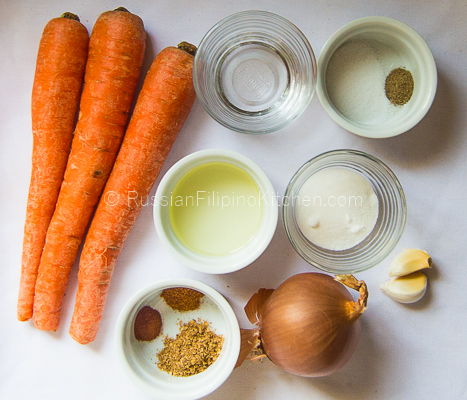 Transfer softened onions into mixing bowl with carrots. Add the rest of the ingredients and mix until well-combined. Transfer to a glass container with lid and refrigerate for at least an hour before serving. Just catching up on your posts my dear Mia, as I have had poor internet connection past few months. I love this Korean twist, as it looks lighter and the sweet touch of onions I am sure gives it a lovely flavor. Thanks for visiting again! I haven’t tried that “other” Russian carrot salad you mentioned. The part about “a whole lot of mayonnaise” makes me laugh! It’s actually true. Most Russian salads use mayonnaise as dressing and they love to sometimes go overboard lol!